We Can Create or Repair Your Docks & Dock Systems on Lake Norman, Mountain Island Lake, Lake Hickory, Lake Wylie, Lake Rhoadhiss, High Rock Lake & Lake James! Living on or near a lake such as Lake Hickory in North Carolina can be a luxurious and enjoyable experience. However, the dock that connects your life to the body of water you reside next to is an essential component of making your experience boating, lounging, or fishing on the dock as enjoyable as possible. 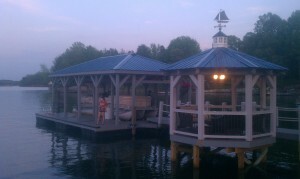 At Renegar Construction, designing, engineering, constructing, and finishing dock systems are our specialties. If you live in the Lake Hickory area and want to transform your rickety old dock system into one that catches your neighbors’ attention, then get in touch with us at Renegar Construction. With 15 years of experience, we know how to adequately fix any problem that you may run into with your docking system. Although we are known for constructing beautiful docking systems throughout North and South Carolina, we also have a reputation for being able to fix any issue that you may encounter with your dock. Our dock repair services are competitively priced, and we promise that we will always be upfront with you about pricing and won’t subject you to any hidden fees. At Renegar Construction, we build some of the most attractive and highly functional dock systems in the area, including stationary docks and floating docks. We use only high-quality materials during the dock construction process to ensure that your docking system will maintain its functionality for many years to come. No job is too large or too small, so if you have a vision for what you want your new dock to look like, we can help you design it and make it a reality.